Natural disasters are physically, socially, and psychologically devastating to a town. It can be extremely difficult to rebuild civic infrastructures and restore the lives of residents. Where do individuals, families, organizations and governments begin to look for help? Are there processes, policies, or protocols in place for dealing with the unthinkable? The Sustainable Disaster Recovery Conference brings together organizations from many different sectors in a collaborative effort to address these types of questions. The Sustainable Disaster Recovery Conference aims to spread awareness of “green” options available to help disaster-stricken towns not just reconstruct their cities, but to rebuild efficient, livable communities that are healthier and stronger than ever before. 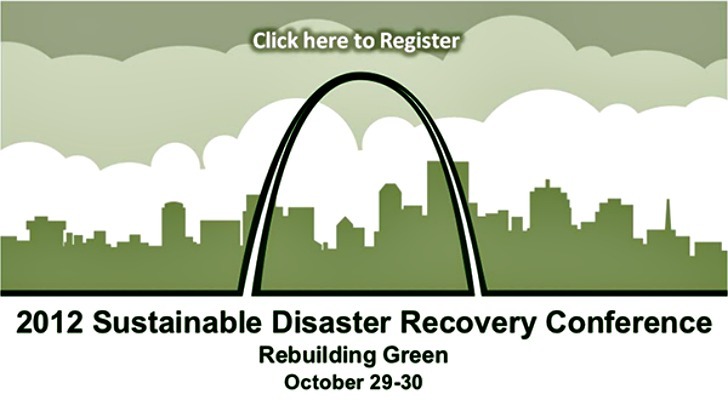 The groundbreaking conference, brought together by The Center for Sustainability, Greensburg GreenTown and GreenTown Joplin, will be held at Saint Louis University in St. Louis, Missouri from Monday, October 29, 2012 through Tuesday, October 30, 2012 ! Find out how you can attend ahead — Inhabitat readers will receive a special discount at registration! Inspiring examples of sustainable rebuilding are happening as we speak! 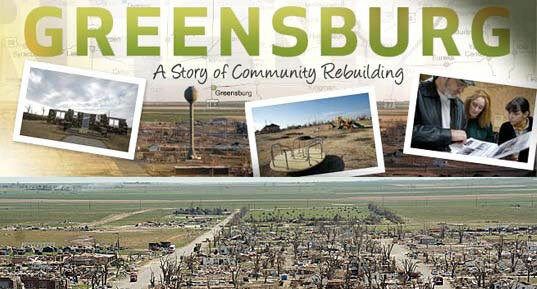 Greensburg, Kansas is a perfect example of how green rebuilding can help a town. In 2007, 95% of the town was destroyed by a massive tornado. Now, five years later Greensburg is on its way to becoming one of the country’s greenest towns, with the most LEED buildings per capita and the nation’s first LEED Platinum certified critical access hospital; the town’s top 13 projects are saving more than $200,000 in energy costs due to their high performance designs. If you want to attend this groundbreaking conference on green recovery, Inhabitat readers can get a pretty sweet deal: enter code SDRC-RG2012 and get an additional $25 off the registration fee! Student registration is complimentary contingent upon the presentation of a valid student ID at check-in. Interested in getting involved in the conference? Apply to become a sponsor or exhibitor or a speaker. Speakers already lined up include Steve Hewitt, former city administrator for Greensburg; Chip Gubera, director of Joplin, Missouri: A Tornado Story; Daniel Wallach, executive director of GreenTown Joplin and Greensburg GreenTown; Jonathan D. Raiche, planning and community development specialist for the City of Joplin, MO; and Joyce Cacho, sustainability consultant for Adinura Advisory, LLC. The conference staff is offering a range of sponsorship and exhibitor levels, but will be more than happy to speak with you about customizing a special package that will fit your needs and budget. They’re also actively seeking papers and proposals for panels right now, so get in touch if you want to present at the conference. As someone who has studied disaster relief efforts, this conference looks very timely and represents a great opportunity to start expanding the dialogue from recovery to rebuilding green. A ton of mistakes were made last year in the wake of Hurricane Irene -parts of the Catskills were devastated. But hundred of thousands of dollars were spent badly. i'm really grateful this event is happening now, with such a quality lineup of speakers. So timely and such a great idea. Can't wait to hear what comes out of this. Very timely and important, hope I can attend! Telling all my St Louis friends about this! ....because one person cannot solve this alone. Great to have a big forum to discuss the future of Disaster Recovery. couldn't have come at a better time. look forward to hearing what comes from this. Love this idea. I hope geodesic or other dome homes are on the docket. We love those for sustainable, hurricane-proof rebuilding! This is such a vital issue—I'm glad it's being addressed in a large forum. As the past few years have shown, this is an extremely important topic in the fields of architecture and design - wish I could attend! What excellent synergy. We are designing passive house for fire victims in Colorado and it give them a positive thing to focus on as well as a better place in the end. Very important event - wish I could join! Kind of an interesting silver lining to natural disasters...the opportunity to rebuild, sustainably, from a clean slate! Natural disasters are physically, socially, and psychologically devastating to a town. It can be extremely difficult to rebuild civic infrastructures and restore the lives of residents. Where do individuals, families, organizations and governments begin to look for help? Are there processes, policies, or protocols in place for dealing with the unthinkable? The Sustainable Disaster Recovery Conference brings together organizations from many different sectors in a collaborative effort to address these types of questions. The Sustainable Disaster Recovery Conference aims to spread awareness of “green” options available to help disaster-stricken towns not just reconstruct their cities, but to rebuild efficient, livable communities that are healthier and stronger than ever before. The groundbreaking conference, brought together by The Center for Sustainability, Greensburg GreenTown and GreenTown Joplin, will be held at Saint Louis University in St. Louis, Missouri from Monday, October 29, 2012 through Tuesday, October 30, 2012 ! Find out how you can attend ahead -- Inhabitat readers will receive a special discount at registration!